Glasgow’s wild parakeet flock is colourful and popular with the locals but their days may be numbered. “Surprisingly parakeets seem to be very adaptable to different environmental conditions,” Mr Whitaker said. Mr Whitaker told BBC Scotland’s The Nine: “Invasive species cause impacts on native wildlife, the economy and the way that we live. “Their droppings can also spread diseases. 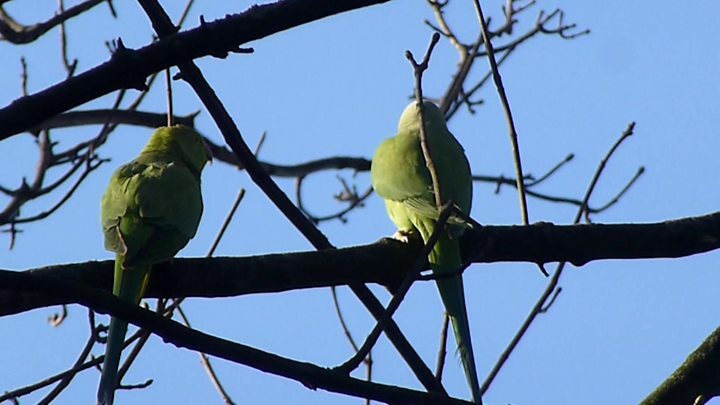 A study is being carried out by government wildlife agency Scottish Natural Heritage to see if Scotland’s only breeding colony of ring-necked parakeets will have to be removed. Mr Whitaker said: “It would be feasible to catch them and potentially rehome them. She said: “On that day that I first saw a parakeet it really took my breath away. She said: “I think to call them an invasive species, why not call them a successful species?